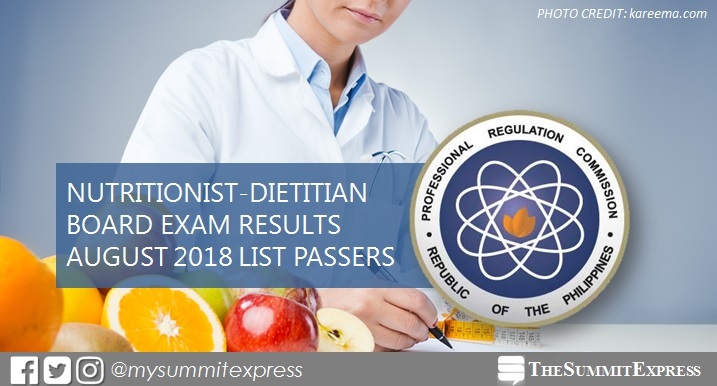 MANILA, Philippines – (Updated August 23) The August 2018 Nutritionist Dietitian board exam results' to include the list of passers, top 10 (topnotchers), top performing schools and performance of schools are released online on Thursday, August 23, 2018 or in two (2) working days after the exam. As announced, 813 out of 1,288 passed the exams. PRC administered the Nutritionist-Dietitian licensure exam on August 19 and 20 in the cities of Manila, Baguio, Cebu, Davao and Zamboanga. From September 3 to September 5, 2018, registration for the issuance of Professional Identification Card (ID) and Certificate of Registration will be done on-line. Please go to http://online1.prc.gov.ph and follow instructions for initial registration. The two-day exam covered nutritional biochemistry and clinical dietitics (35%) and community and public health (30%) on Day 1; and another 35% for foods and food service systems on the second day. Based on PRC Resolution No. 2017-1068, the target release Nutritionist Dietitian board exam result is on Thursday, August 23, 2018 or in two (2) working days after the exam. However, results might be released ahead of the target or on later date without prior notice. In the same period last year (August 2017), PRC announced results in 2 working days. A total of 916 out of 1,279 passed the exam. Polytechnic University of the Philippines (PUP) - Sta. Mesa graduate Abigail Ringalota Catacutan topped the board with 91.00%. In the March 2017 exam, results were out in 2 working days. PRC named 755 out of 1,047 who passed the series of tests. Pauline Catrina Macabuag Vizcarra from University of Santo Tomas (UST) aced the board with 87.95%. In August 2015 exam, PRC also released results in 2 working days after the tests. A total of 705 out of 1,089 passed with University of the Philippines (UP) - Los Banos grad topped the exam. The Summit Express will update this page immediately once the results are officially released online. Monitor announcement here or visit the official website of PRC (prc.gov.ph) for more information.